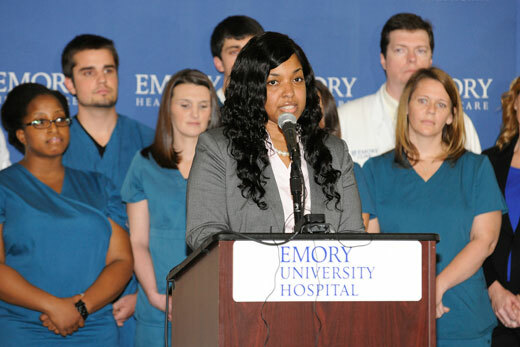 During the Oct. 28 press conference, Amber Vinson was joined on the stage by Emory University Hospital team members who helped her recover from Ebola virus disease. Photo by Jack Kearse. Accompanied by beaming family members and amidst hugs and applause from the health care workers who treated her, nurse Amber Vinson departed a press conference at Emory University Hospital on Tuesday as the fourth patient successfully treated for Ebola virus infection here. 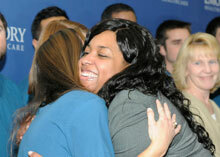 "As a nurse, and now as someone who has experienced what it's like to be cared for through a life-threatening illness, I am so appreciative and grateful for your exceptional skill, warmth and care," Vinson told the more than two dozen Emory University Hospital employees gathered behind her on the stage during the press conference. Prior to Vinson's remarks, Dr. Bruce Ribner, medical director for Emory University Hospital's Serious Communicable Disease Unit, discussed her discharge, Emory's commitment to caring for such patients, and how the hospital seeks to share its knowledge to help others battling Ebola virus disease around the world. "After a rigorous course of treatment and thorough testing, we have determined that Ms. Vinson has recovered from her infection with Ebola virus, and that she can return to her family, to the community and to her life, without any concerns about transmitting this virus to any other individuals," Riber said. Vinson was the second of two health care workers infected while caring for a patient with Ebola virus disease at Texas Health Presbyterian Hospital in Dallas. She was transferred to Emory University Hospital via air ambulance on Oct. 15 by request of the Centers for Disease Control and Prevention and Texas Health Resources. "As fellow members of the health care community, we deeply admire Ms. Vinson's courage and dedication in caring for patients with serious communicable diseases," Ribner said. "Nurses are on the front lines 24 hours a day in treating our patients, and it is their skill, their knowledge, and their passion for healing that makes one of the critical differences in caring for our patients." The patient Vinson cared for became infected with Ebola in Liberia, then traveled to Dallas where he became ill, was diagnosed and treated at Texas Health Presbyterian Hospital, and died Oct. 8. Vinson and another nurse who cared for the patient in Dallas, Nina Pham, were the first people to become infected with the Ebola virus in the United States. Pham was transferred to the National Institutes of Health in Bethesda, Maryland, the day after Vinson's transfer to Emory; she was discharged from NIH, free of the virus, Oct. 24. "Now that Ebola virus transmission has occurred in the United States, we all recognize that there is a lot of anxiety in the community, and that is understandable. But the American health care system has been able to successfully treat patients with Ebola virus disease. We have the resources, we have the expertise and we have the knowledge," Ribner said. "We must not let fear get in the way of our primary mission, which is caring for patients with serious diseases such as Ebola virus infection." Vinson is the fourth patient to be successfully treated at Emory University Hospital for Ebola virus infection. Dr. Kent Brantly and Nancy Writebol, the first Ebola patients to be treated in the United States, arrived at Emory University Hospital in early August after becoming infected with the Ebola virus while providing humanitarian aid in Liberia. Writebol was discharged Aug. 19; Brantly left the hospital Aug. 21. A third patient, who did not want to be identified publicly, was transported to Emory on Sept. 9 and was discharged Oct. 19. All of the patients were treated in Emory University Hospital's Serious Communicable Disease Unit, which was set up 12 years ago in collaboration with the CDC to care for CDC scientists and others who have traveled abroad and become exposed to infectious diseases. On Oct. 20, Emory Healthcare launched an external website to serve as a resource for health care organizations regarding best practices for safe and effective screening, diagnosis and treatment for patients with Ebola virus disease. "As grateful as we are for Ms. Vinson's recovery, we do recognize that our role as the American health care system, and our nation's role, is far from over," Ribner noted. "Emory has taken a lead in posting our protocols online as well as participating in webinars, answering myriads of phone calls and emails, and trying to spread knowledge of the management of this disease around the world." Vinson: "I am so grateful to be well"
As Amber Vinson departed Tuesday's press conference, she hugged each of the health care workers involved in her treatment. Photo by Jack Kearse. During the Oct. 28 press conference, Vinson was joined on the stage by the Emory University Hospital employees who helped care for her, as well as her grandparents, aunt and uncle. "I am so grateful to be well, and — first and foremost — I want to thank God. I sincerely believe that with God all things are possible," Vinson said. "While the skill and dedication of the doctors, nurses and others who have taken care of me have obviously led to my recovery, it has been God's love that has truly carried my family and me through this difficult time, and has played such an important role in giving me hope and the strength to fight." Vinson thanked her family and all of those who contributed to her care at Emory Healthcare and at Texas Health Presbyterian Hospital. She also thanked Brantly and Writebol "for your donations of plasma for me and other patients, and thank you for your leadership in helping to educate the public about this difficult but treatable disease." Vinson offered a plea for continued attention to the plight of Ebola victims around the world. "While this is a day for celebration and gratitude, I ask that we not lose focus on the thousands of families who continue to labor under the burden of this disease in West Africa," she said. Vinson did not take questions after giving her statement, but remained on the stage with her family while Ribner answered questions from the media. Several questions centered on what Emory has learned from successfully treating four patients with varying severities of illness from Ebola virus infection. Since beginning caring for Ebola patients in August, Emory physicians have confirmed that they can be tremendously helped by the kind of aggressive supportive care available at Emory and other hospitals in developed countries, Ribner said. "The other thing that we have really changed the mindset on is how aggressive we can be with Ebola virus disease," he said, noting that previously, the prevailing medical mindset was if Ebola patients were ill enough to need dialysis or ventilators, "there was no purpose in doing those interventions because they would invariably die." "I think we have shown, with our colleagues in the U.S. and elsewhere, that that is certainly not the case, and therefore I think we have changed the algorithm for how aggressive we are going to be willing to be in caring for our patients with Ebola virus disease," he said. Doctors don't know definitively why Vinson and Pham recovered more quickly than some other patients with Ebola, Ribner said. One theory is that the two nurses are among the youngest patients treated for Ebola infection in developed countries, and evidence from Africa suggests younger people are more likely to recover. Ribner also noted that Vinson was wearing personal protective equipment when she cared for the Dallas patient "and therefore the amount of virus that she was exposed to was substantially less than what we see in patients who get infected in less developed countries." In response to a question about quarantine, Ribner noted the need to reassure the American public and advocated for a global perspective. "I think the thing we really have to keep in mind is that the only way that we are truly going to be able to make our citizens safe is if we control the outbreak in West Africa, which is having a devastating impact on those countries. And so as we put in place various measures to try and protect citizens of this country, we have to be very mindful of any unintended consequences which may make it more difficult to manage patients in the African continent," he said, while noting that Emory is represented on an Ebola task force created by Georgia Gov. Nathan Deal to offer guidance on such issues here. Asked what overall message he would give to help quell public fear over Ebola, Ribner offered a reminder that the Ebola virus is spread through blood and other bodily fluids, not through the air or casual contact. "Again, as we look at measures in the United States to potentially control additional exposures that might occur, we need to keep the science in mind," he said.